1. Digital Paywall Converters (21% of total respondents) buy a digital subscription for its unlimited access. They subscribe because they like to read interesting articles and want to support local journalism. Digital Paywall Converters tend to be younger, male, educated, have higher income, and are Democrat. 2. Topic Hunters (23% of total respondents) are motivated to subscribe because of local politics and/or local sports (college or high school). They tend to be well educated and favor the digital experience. They often convert to subscribing because they are very engaged and hit a paywall meter limit. Since Topic Hunters tend to be more digital, the best time to convert these readers to paying subscribers is when they are online. Using analytical tools (e.g. API’s Metrics for News) to track readers by topic is helpful in the conversion process. Newsletters can also be useful to engage readers around their interest areas and can help lead to paid subscriptions. 3. Locally Engaged subscribers (18% of total respondents) are interested in content about the community. They like being engaged and informed locally. They report that access to local news and politics are the major reasons they subscribe to newspapers. These subscribers are “news junkies,” especially about where they live, and want the news regardless of a discounted sale. The Locally Engaged are an important segment for smaller publications. Nearly half of the Locally Engaged subscribe to a small or medium-sized paper. Further, the Locally Engaged are more likely than other subscribers to value the accuracy and reliability of the news publication. News alerts and email newsletters on local government, neighborhood, and other local civic topics are goods ways to attract and engage these subscribers. 4. Social Media-Mobile Discoverers (19% of total respondents) are subscribers who engage socially and use their mobile to access newspapers. They are very active with newspapers through news alerts, following journalists on social media and by sharing content. 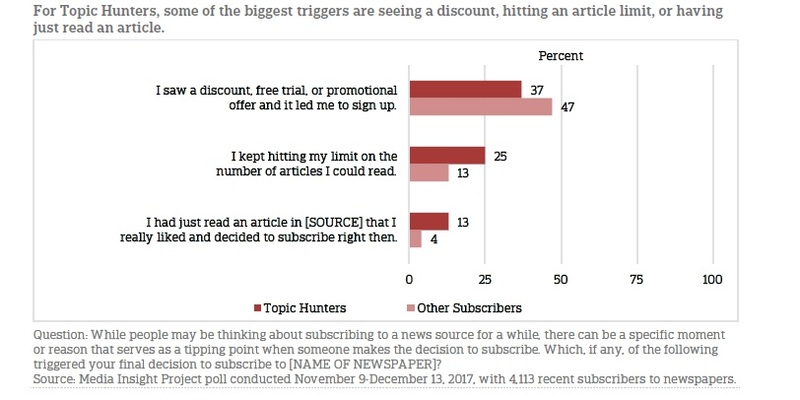 Once they reach their metered limit, this segment (25%) is motivated to subscribe, particularly if they receive a promotional offer for unlimited articles. It’s important for publishers to consider mobile and social as two important paths to discover this segment of young readers. Social Media-Mobile Discoverers tend to skew slightly female (53% vs. 46%), are much younger (51% are under the age of 60 vs. 28% of other subscribers) and are likely to be Democrats. 5. Journalism Advocates (24% of total respondents) subscribe to newspaper to support journalism. This segment values supporting news publishers and also likes to keep political leaders in check. Most Journalism Advocates identify themselves as Democrats. They are more likely than other subscribers to have a college degree (76% vs. 64%) and are also younger (40% under age 60 vs. 30%). 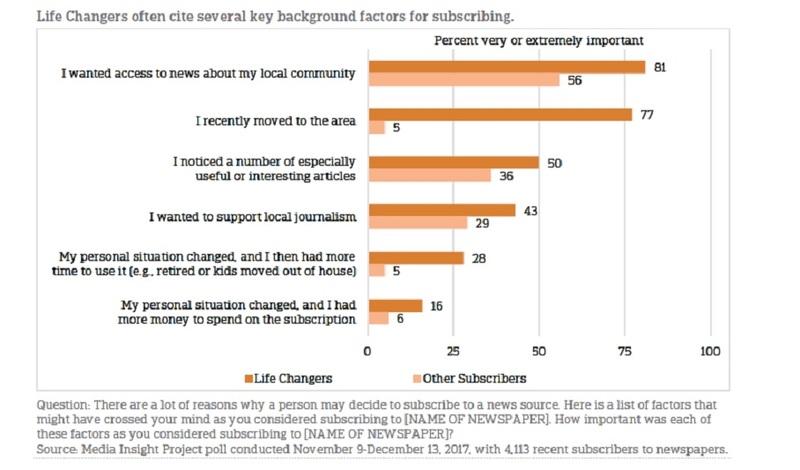 Journalism Advocates are much more likely than other subscribers to mention they were attracted to subscribe because they witnessed attacks on the news media (25% vs. 2%) and because of they saw messaging to support local journalism (23% vs. 1%). 6. Life Changers (16% of total respondents) subscribe because of a transition in their life, be it a move or new job. For Life Changers, a subscription is not based on the editorial or marketing offer of the newspaper. Life Changers highly value local news and want to support local journalism. This segment is likely to prefer the print access over digital. To target Life Changers, publishers should find readers who are new to the area, recent graduates, retirees or transplants. They should seek partnerships with local organizations or groups, such as realtors, colleges, or employers, to offer discounted subscriptions. Life Changers and Locally Engaged both have an affinity for following local news. 7. Coupon Clippers (12% of total respondents) subscribe to newspapers because of the value of the discounted offer. Discounts and promotions motivate Coupon Clippers to subscribe. This group is more likely to be women, identify as Republicans or independents, have less education and lower incomes, live in the suburbs and prefers print. 8. Print Fans (16% of total respondents) like the experience of reading a printed newspaper. They are big fans of print home delivery. While they also use a newspapers’ digital app, they like to start their day with a hard copy of the news. The majority of Print Fans are female and more than half live in the suburbs. This segment is very interested in gaining access to exclusive content that is available only to those who subscribe to both print and digital. 9. Friends and Family (15% of total respondents) subscribe because they see it as a way to connect with loved ones. The paper is an extension of their social lives. It’s what they talk about over dinner or in a telephone conversation. Local news is important to Friends and Family but current events and other topics (lifestyle, sports, etc.) are also important. Friends and Family tend to skew heavily female compared with other subscribers (60% vs. 45%), be Democrats (61% vs. 48 of other subscribers) and are slightly more urban (36% vs. 27%). Publishers should think about testing “refer a friend” programs, where subscribers can refer friends or family to receive a discount or as a gift. Publishers should also offer discounts and benefits to those who refer new subscribers. Consumers interact with a newspaper and its journalists in many ways before subscribing. It’s important for publishers to study these interactions and identify the moments of engagement. 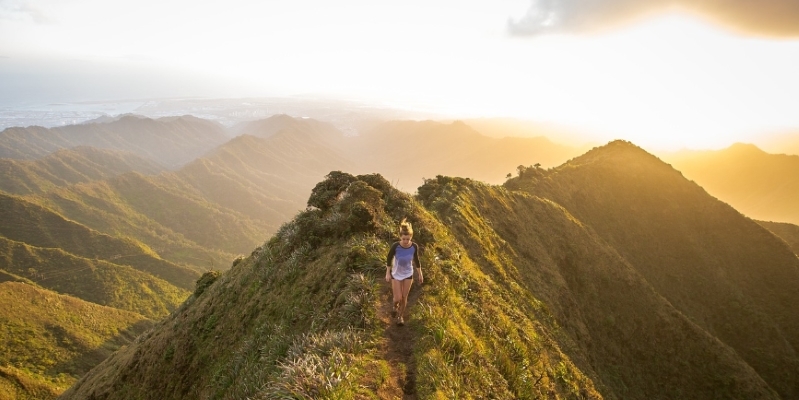 Identifying these moments along with important background factors are strong targeting opportunities to add subscribers.